Hoboken and Jersey City are NYC’s sixth and seventh boroughs. Contrary to what you might see on my website forgotten-ny.com, I do get out of New York City on occasion. In fact, I have posted entries from San Francisco, Los Angeles and even London (my friend Allan Dade, who just passed away this week, supplied some classic bishop crook lampposts formerly in use in London and environs). Though residents of Hoboken and Jersey City would take issue with the sentiment, I think of both towns as New York’s sixth and seventh boroughs since their architecture resembles New York’s so much, at least in the older, more urban sections. I haven’t done any comprehensive surveys in Newark just yet, but it’s always in the back of my mind. One recent foray into Jersey City began with a strange (to me) map notation on a Geographia Hudson County atlas, specifically, in Jersey City at Wayne and Monmouth Sts. just west of downtown. “Dixon Crucible” it read, and I was drawn there just to see what this was all about. A crucible is a vessel made of a refractory substance such as graphite or porcelain, used for melting and calcining materials at high temperatures, but it has a broader meaning as a severe test, or a situation or place that severely tests all those that experience it, such as the Depression or my tenure at the World’s Biggest Store. That meaning of the word may or may not have been helped along by Arthur Miller’s Cold War era play. 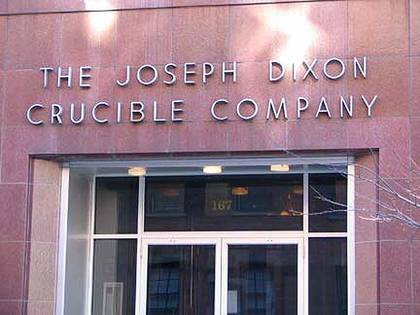 It turns out that “Dixon Crucible” turns out to be an incredibly handsome collection of brick buildings in a Romanesque style that used to be the world headquarters of one of the worlds’ largest pencil companies, Dixon Ticonderoga. In 1827, Marblehead, MA native Joseph Dixon (1799-1869) went into business manufacturing crucibles, containers that can withstand extremely high temperatures which, among other purposes, employ lead and graphite to make pencils, first developed in the 1800s as writing tools that employed dark-colored, lightly greasy substances including graphite. Pencils began to oust the quill pen as affordable writing implements during the Civil War era, and Dixon Ticonderoga, its pencils with the familiar yellow color and green metal bands above the eraser, became along with Eberhard Faber, the leaders in American pencil manufacturing. 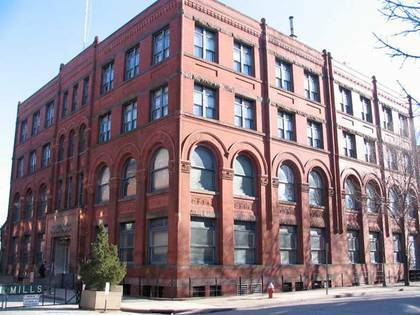 By 1871 the company was producing 86,000 five-cent pencils per day. Brooklyn also has many remnants of the old Faber pencil works still standing in Greenpoint, while the Faber family settled on the north shore of Staten Island, remembered today by Faber Park and Pool in Port Richmond. Dixon didn’t concentrate on strictly pencils, however; he created graphite stove polish, fast-color dyes, developed an early form of photolithography, and produced steel at the cluster of buildings seen here, which were built between 1845 and 1850 along Wayne St., Monmouth St., and what’s now Christopher Columbus Boulevard. The building seen above was home to the company’s offices. The front of the complex was given an incongruous Moderne front entrance in the 1940s, but that in itself has attained classic status over the decades. 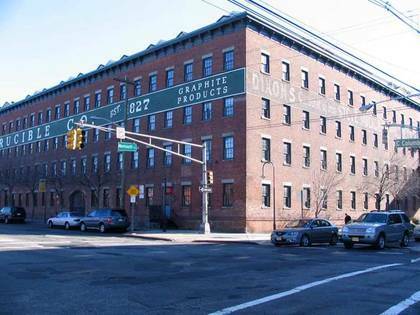 Dixon Ticonderoga, now located near Orlando, Florida, sold its Jersey City locale in 1986 and it was converted to a mixed use complex of 452 apartments, retail units, and a health club, known as Dixon Mills. Jersey City Architect James N. Lindemon did a creditable job preserving the complex’s 19th-century touches, and added a couple of elements faithful to the spirit of the complex when it was one of America’s leading manufacturers. The other buildings in the complex aren’t as fancy as the Romanesque office building—just good old solid brick construction and an unbroken line of windows. I love architecture like this (I’ve never lived in a building other than a brick building and probably never will)—it just looks impregnable, solid, timeless, and indestructible. This is the NE corner of Monmouth and Columbus. Note the new retro-style sign on the Columbus side, and the Real McCoy, faded but hanging in there, on the Monmouth side. Christopher Columbus Dr., the northernmost east-west route in the Van Vorst Park area, was once known as North and South Railroad Ave. and featured an elevated trestle carrying the Pennsylvania Railroad to a Hudson River-side terminal and yard. The yards, terminal and trestle were torn down or paved over by the 1950s, and today the Harborside Financial Center sits on land where the yard used to be. I’ve always been intrigued by factories that’ve been converted to residences, and high-end or not, I’m happy with what Dixon Mills has done here.